Costa Rica's National Emergencies Commission (CNE) downgraded a public alert from "red" to "yellow" on Sunday after a capsized barge had spilled 180 tons of ammonium nitrate off the Pacific coast of the Central American country. Initially, the CNE said that the red alert was a precautionary measure, banning all human contact with the sea water. The government body also banned the consumption of seafood from the coastal area off the port city of Puntarenas, which is 60 kilometers west of the capital, San Jose. However, after carrying out investigations and flying over the affected sea area, the authorities decided to downgrade the alert to yellow. This means that restrictions on seafood and contacting with the sea have been lifted. "The Costan Rican government, when faced with any event that threatens the imminent security and health of our citizens, will always take necessary measures," said cabinet minister, Sergio Alfaro, during a news conference. The Marine Science Investigation Center at the University of Costa Rica recommended maintaining the close season around the Gulf of Nicoya until May 6. The Chief Executive Officer of the Institute for Aqueducts and Sewage Systems, Yamileth Astorga, said that the results of the investigations would be available in 72 hours. With these results, the government will be able to determine the quality of the water. However, the main concern is to find out the impact that the spillage has caused to marine life. ' 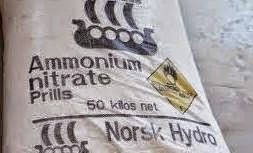 Ammonium nitrate is used as fertilizers in agricultural activities and is toxic to all living creatures if taking in large quantities. Local authorities said that they would keep an eye out for the appearance of a red tide and they would also monitor and safely extract the fuel from the barge which capsized on Saturday afternoon due to strong waves.